There are very few things in my wardrobe that can’t do double duty. I’m all about being able to wear a summer dress in the winter, or finding a pair of trousers that are perfect for work but also look great with a tshirt and sandals for a day pootling about in the weekend. The one area where this can get a bit trickier is Fancy Clothes, by which I mean the special dresses that we buy for events like a graduation or a friend’s wedding that we subsequently have to try and find an opportunity to wear in our decidedly non-fancy day to day lives. I’ve written before about wearing a party dress to work, but how about wearing those dresses on the weekend? Without looking insane? To that end, I raided Wilson Trollope’s new season and used two opposite techniques – let’s call them “Over vs Under” – to make two very different dresses appropriate for a more casual setting. This highly embroidered dress is beautiful, and a great option for a date night somewhere a bit nice, or an event that requires something gorgeous without going black tie. I paired it with my favourite and fluffiest bag, the Fluffy Bluff from Pedro’s Bluff, and kept the textures coming with a studded belt and a pair of heeled loafers. Comfortable but good lookin’, which is essentially what I aim for in every look I wear. You don’t want to leave all this prettiness languishing in your closet though, so it’s time to find a way to wear this out on the town during daylight hours. Getting double duty out of this dress is about hiding that bodice detail and closing in the amount of embroidery, essentially creating a skirt out of a dress. I went for a bit of print mixing with this polka dot sweatshirt, tucking the front under to crop it at a better point on my body (and to further reinforce the illusion of a skirt). Switching out the heeled loafer for a flat option, and keeping the casual vibe alive with this khaki green bag, all contributes to a look that I could comfortably wear down to brunch on the weekend or to a casual night out over some burgers. For an alternative, you can of course go for a jumper instead of a sweatshirt, and I can imagine this same look with the navy cashmere turtleneck I just got my friend to courier back from Australia for me. You can switch out flat shoes for a pair of boots, or try the newest styling option of wearing a denim jacket fully buttoned up like a shirt. The essence is finding more casual fabrics and styles to mix back with this in way that cuts down on the visual impact of that fabric. From embroidery to print, and a really different starting point. This airy, layered dress has no waist band, cascading down in two tiers of floaty patterned fabric. I’ve worn it here with this velvet blazer, which is cut fetchingly into a lower back (does it remind me of the men’s clothing in Pride and Prejudice? Yes, and I am loving it very much) and then razzled my dazzle with my silver earrings from Gorman and my silver pointed heels. Legitimately fancy, would definitely look weird if I wore this down to Husk on a Saturday morning for eggs. I didn’t want to layer over this dress, because its best feature is it’s A-line cut and all those layers – so I want to be able to see that, but also I don’t want to try and fit all that under a jumper. That’s no worries because I am the Queen of Layering Turtlenecks Under Things, as demonstrated here. I kept the entire under layer blue, adding these jeans to make things even more casual but mostly to make sure that I was nice and warm on our cool Wellington mornings. I brought back the earrings as a brooch – pin through the merino jumper, which won’t show holes – which isn’t at all necessary but tickled my fancy. Finally touch is a pair of ridiculous sneakers with floral details to mirror both the print and the earring/brooch, and I’ve sorted myself an outfit that’s 100% weekend appropriate and keeps the beautiful print and design of this dress intact. Note how I’ve pulled up the sleeves and continued the layering there, which is a simple way to make things look a bit more like you did them on purpose, rather than just putting on a bunch of layers. If you’re going to buy better quality clothes, with the higher price tag they usually attract, or things that are special and beautiful, it’s still important to get a good amount of wear out of them. They still had to be manufactured, they still have a footprint, and so we want to make sure we’re not limiting the opportunities to keep these items going. 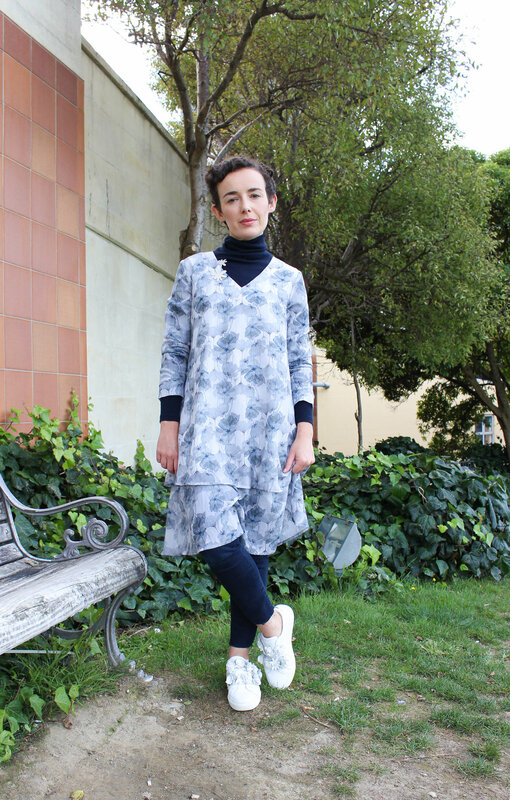 Going into cooler, darker weather here in New Zealand, repurposing your fancier clothes also provide you with a chance to bring print, embroidery, perhaps sequins or other great textural elements into your day to day wardrobe without having to spend anything. Plus, your fancy bits and bobs are probably imbued with happy memories, and a wee rush of pleasant nostalgia can only be good on a winter’s morning. Have fun!